This tutorial will demonstrate how to install the Debian root filestem (ie. ‘/’) on a USB drive instead of the SD card. The SD card still retains the /boot partion and swap space. This requires a modified kernel to support the USB storage. You can download the minimal modified kernel and modules here or follow my guide on how to compile it for yourself. In either case, begin by installing the Debian image as you normally would to an SD card. Manually format the USB drive you intend to use as the root filesystem as ext4 using a utility like gparted. Next, copy the root filesytem from the Debian install on the SD card to the USB drive, preserving attributes with the -a flag, substituting “sdcard-rootfs-partition-uuid” and “usbdrive-rootfs-partition-uuid” with the respective identifiers as the filesystem are mounted in Ubuntu. Now, delete the existing kernel.img and replace it with the new one, substituting “sdcard-boot-partition-uuid” with the identifier of the partion as it is mounted in Ubuntu. That’s it! 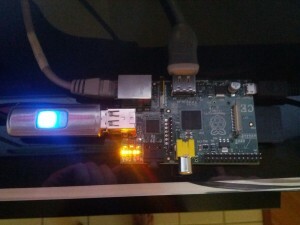 Plug in and boot up the root filesystem from the USB stick! 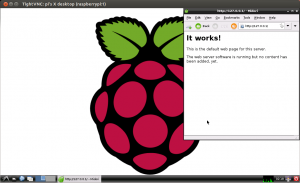 This tutorial will demonstrate how to cross compile the kernel for the Raspberry Pi on Ubuntu 12.04 LTS. 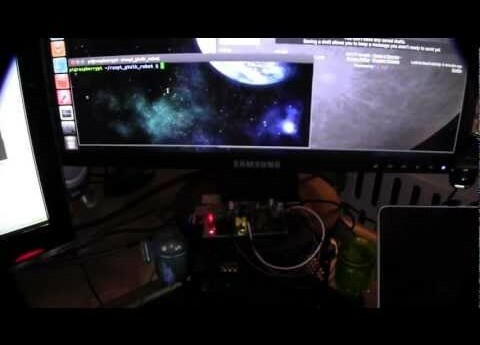 The kernel is functional with both the Debian and Arch Linux Raspberry Pi images. UPDATE: Alternatively, you can use the following Ansible playbook playbook-raspi_kernel_crosscompile. Note that you have to edit host_vars/localhost.yml file with your local sudo password. Now we need to use imagetool-uncompressed.py from the tools repo to get the kernel ready for the Pi. This creates a kernel.img in the current directory. Plug in the SD card of the existing Debian image that you wish to install the new kernel on. Delete the existing kernel.img and replace it with the new one, substituting “boot-partition-uuid” with the identifier of the partion as it is mounted in Ubuntu. Next, remove the existing /lib/modules and lib/firmware directories, substituting “rootfs-partition-uuid” with the identifier of the root filesystem partion mounted in Ubuntu. That’s it! 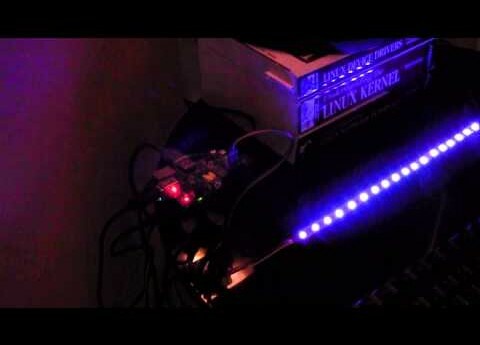 Exject the SD card, and boot the new kernel on the Raspberry Pi! 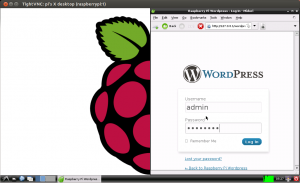 This tutorial will demonstrate how to install and host WordPress on Raspberry Pi. This process assumes you have Debian for Raspberry Pi installed on an SD card. 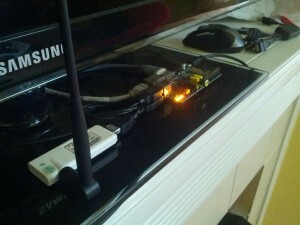 If not, see RPi Easy SD card setup. WordPress runs on the Apache2 web server. To setup Apache, follow the instructions in my previous post, Raspberry Pi and Apache. UPDATE: 9/18/12: The following group creation error appears to have been corrected in an updated package and should no longer be necessary. Then navigate to the corresponding IP address of the Pi. 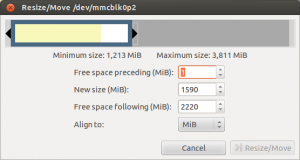 Easy Install & Resize the SD Card on the Raspberry Pi on Ubuntu. The screen will display the current partition layout on the SD card, notably how much extra space is currently unused, in this case, almost 2GB. 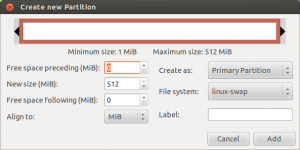 The first step is to delete the swap partition at the bottom of the table To do this, right click partition 3 (/dev/mmcblkp03) and select delete. Notice that the operations pending section now displays this change. Note: If the partitions are locked, they will need to first be unmounted before they can be modified. To do so, right click on the partition, and select ‘unmount’ (Thanks Anand). Click the Resize/Move button, and you will return to the main screen. Notice that the operations pending now also shows the grow operation. Note: If this displays move and grow, instead of just grow, cancel the operation and try again. Close out of GParted, and eject the SD card. It is already unmounted from the partitioning operation. Enjoy the extra space on your Raspberry Pi!